On February 5, 2019, His Holiness Patriarch Mor Ignatius Aphrem II participated in gardening campaign, in the fields of Antioch Syrian University, at the university headquarters in Maarat Saydnaya – Rif Dimashq. He was accompanied by their Eminences Mor Dionysius Jean Kawak, Patriarchal Vicar for the Archdiocese of the Eastern United States of America, Mor Maurice Amsih, Archbishop of Al-Jazeerah and Euphrates. 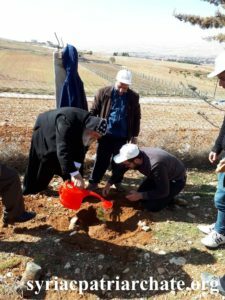 His Holiness planted the first plant; then, the university Administrative and Academic staff along with all the students continued the campaign through the day.